This year's edition was game number two, and I was not yet coming to the club. I don't remember what I was thinking, but I make a blunder and suffered a slow death. In this position, I had a lot of better choices than Bxg7. 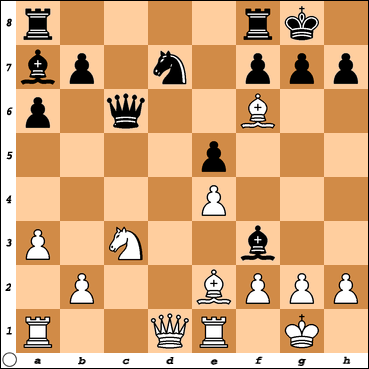 Nd5 is probably the coolest, threatening to fork king and queen with Ne7+. However, Be7, Bh4, Bg5 are all better places to put the bishop. I guess this year's lesson from dad was to look before you leap. It is easier for a son to lose to his dad than the other way around, especially when the son is young. At a young age, the chess relationship is more master - disciple than as competitors. My dad and I didn't play much in the master - disciple mode. Most of our games were as competitors. Losing wasn't hard for me, it just motivated me to get better. But I had already won the first game, so I knew I could beat him. Just having that knowledge, my the losses were easier to take. 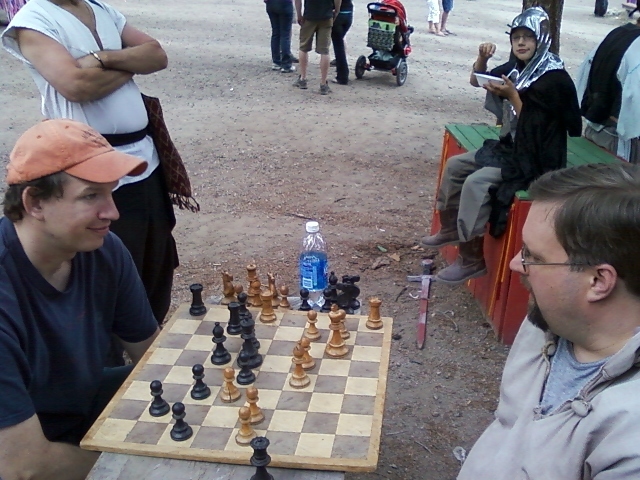 I kind of have that mentality when I am playing the dads at the Renaissance fesitval. I feel like it is my job to show the kids that their dads can be beaten. Over and over. It was that way with Joe Waggoner. He brings his son to the Renaissance Fair every year and wins bracelet after bracelet until his son's entire arm is covered in chain mail. I found this out because he thought Buck had quit the fair after his victories last year. Buck is always one of the monks at the fair when Joe and his son show up. He thought he knocked Buck out of chess like LM Brian Wall knocked him out of chess. Well, he was back for another bracelet this year when he and his son took on Alex Freeman the first time Alex was trying to play 2 boards at once. Of course, Alex beat the son but lost to Joe. So, I had to make it my goal to restore the honor of the monks and show Joe's son that dad could be beat. Joe gave it 3 tries before the cannon blast, and he was very close in a couple of games, but I am proud to say that Joe's son happily ate his ice cream set in the fact that his dad is not invincible and someday he too can beat his old man. 1. d4 d5 2. c4 dxc4 3. e4 e5 4. d5 Nf6 5. Nc3 Bc5 6. Bxc4 O-O 7. Bg5 a6 8. Nf3 Qd6 9. O-O Bg4 10. Be2 Nbd7 11. a3 c6 12. Re1 Ba7 13. 19. Qf3 Qe6 20. Rd3 Qg4 21. Qg3 Qxg3 22. Rxg3+ Kh8 23. Re1 Rg8 24. Rf3 Rg6 25. 32. a4 Rc6 33. axb5 axb5 34. Rb2 Rc5 35. Kf2 Nd6 36. Rd2 Nc8 37. Rd3 Nb6 38. On June 14th, the CSCC had 5 members in attendance. The participants played speed games, but no score was kept. 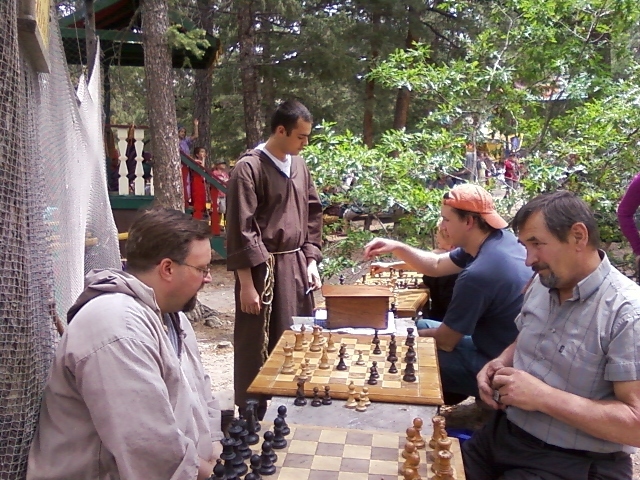 Several members of the club are playing chess as monks at the Renaissance Festival this summer to promote the clubs around the state. Alex Freeman and I played on June 18th beating all comers except Joe Wagoner, who took home a chain mail bracelet.